The circle of an Ionic cross symbolizes eternal life in Christ. 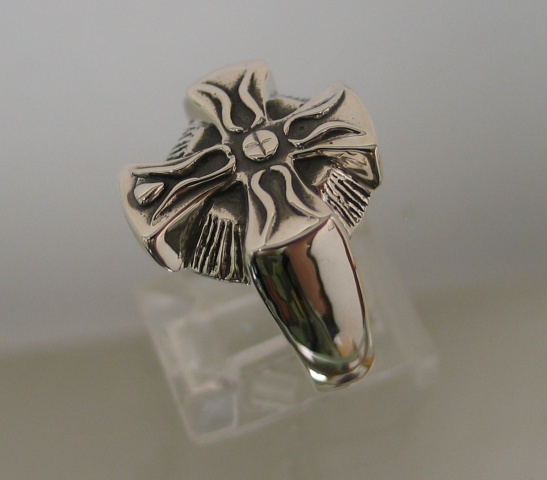 The designs repeated on each arm of this cross are tongues of fire, a representation of the Holy Spirit. The shape formed by each pair of flames suggests the ichthus, a sign of Christ's followers. The host in center represents our Bread of Life, Jesus Christ. This cross was designed to commemorate the 50th anniversary of St. Luke's Episcopal Church in Dallas, Texas.